Born in Vernon, BC, McCall and his family came to Calgary in 1906. As a young man looking to serve the country, he enlisted with the 175th Battalion of the Canadian Expeditionary Force (CEF) in 1916. Eight months later, he was in France overseeing the battalion as sergeant. In 1917 McCall received a commission as a lieutenant pilot trainee, and in December was assigned to No. XIII Sqaudron RAF on the Western Front. McCall’s assigned airplane was the Royal Aircraft Factory R.E. 8, a scrappy little two-seater craft that had improved speed and climb over its inferior predecessor, the B.E. 2. It allowed for better payload delivery over longer distances, an essential strategy in the wide-ranging and many battle fronts of WWI. The craft would serve McCall well in that first World War. McCall’s first aerial victory occurred while flying the R.E.8, shooting down a German aircraft. McCall was awarded the Military Cross “for conspicuous gallantry and devotion to duty,” and two weeks later the accompanying Bar for downing an enemy scout aircraft while on a mission to take photographs. After his third victory while flying the R.E.8, McCall was next transferred to No. 41 Squadron RAF and began flying the Royal Aircraft Factory S.E.5. He was awarded the Distinguished Flying Cross after scoring four “kills” in May 1918. On June 28th, 1918 McCall downed four enemy aircraft, including one shared with Eric John Stephens. Just two days later, on June 30th, Captain McCall downed five more Germans, four in the morning and the fifth that evening. For this McCall was awarded the Distinguished Service Order. Following the armistice, the pilot embarked upon a variety of civil aviation ventures, beginning with the risky and audacious profession of stunt flying. On July 5th, 1919, while barnstorming, he crash-landed when his engine failed while he was taking off. His landing site was the top of the merry-go-round at the Calgary Exhibition and Stampede. He and his two passengers walked away from the jaw-dropping mishap. He founded his own company, McCall Aero Corporation Limited, in 1920. With this company McCall flew commercial freight and passengers across Canada, pioneering air travel to Banff. Later, he founded another aviation company, Great Western Airways. One of his more spectacular achievements was the flying of 200 quarts of nitroglycerin from Shelby, Montana to Calgary in 1928. The following year, he ignored bad weather to fly a doctor to the Skiff oil fields to treat two seriously injured workers. 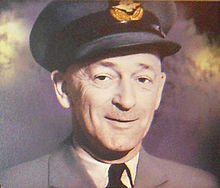 As the Second World War began, McCall was recalled to service with the Royal Canadian Air Force as a Squadron Leader, based at numerous western Canadian bases. He died in Calgary in ‘49 at the age of 52. Freddie McCall appears in exhibits in several museums in and around Calgary, such as the Glenbow Museum and the Calgary Aerospace Museum. In 1939 the Calgary Airport was named after him but has since been renamed Calgary International Airport. If you make your way to McCall Industrial Park, McCall Way leading to and from the Airport or McCall Lake golf course, remember this remarkable Calgarian for a moment or two as his legacy survives in our bustling city. Vanessa is an editor and social media coordinator at Great News Media.